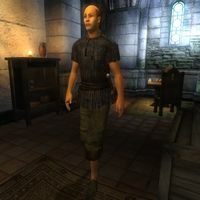 Faelian is an Altmer noble living at the Tiber Septim Hotel in the Imperial City's Talos Plaza District with his girlfriend, Atraena. Faelian hangs with a rather seedy crowd, and has some definite Skooma addiction issues, such as the fact that his ability to talk has been reduced to mere jitters, and carries the craving of Skooma in almost every line. According to Atraena, Faenlian was a fine and well mannered gentleman before he got addicted to Skooma.